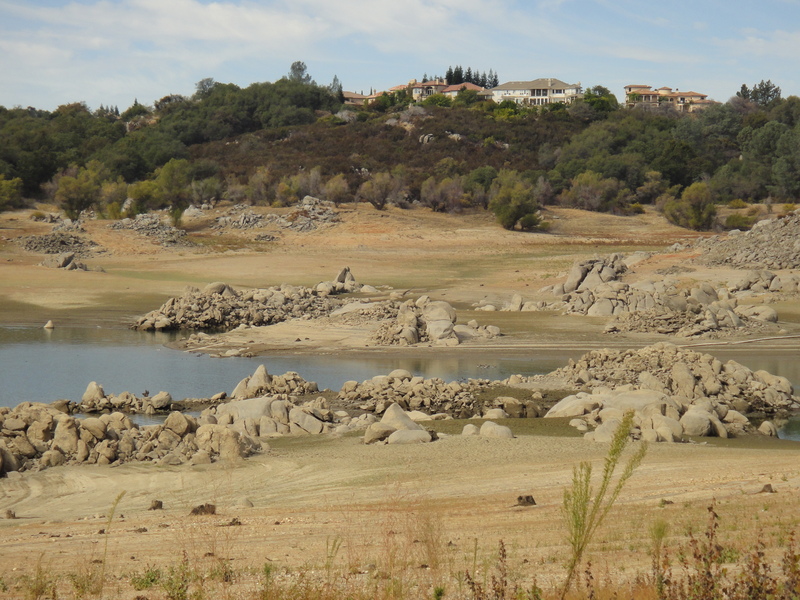 Here’s Folsom Lake in mid-August. That’s a turkey vulture (Cathartes aura) circling over former fish territory. It takes a power of walking to reach the water these days. 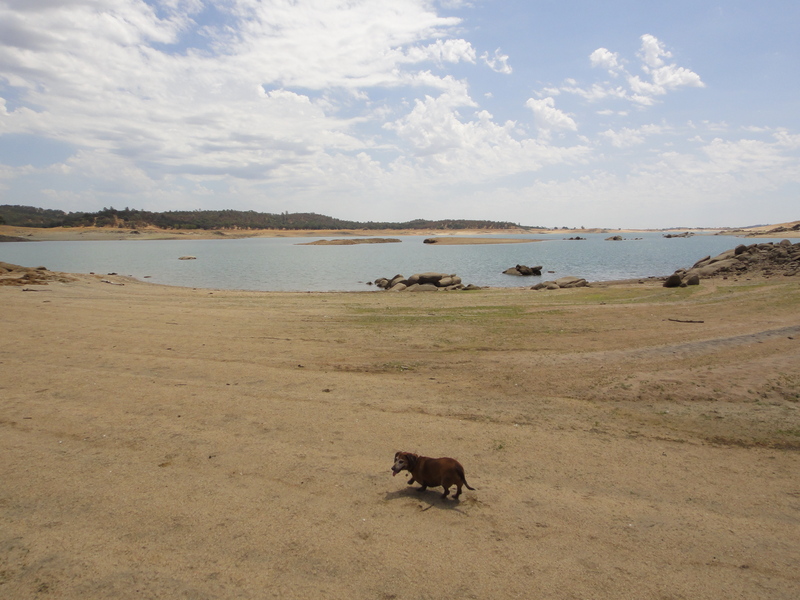 This is the NW side of the lake around Beek’s Bight where tubby Rusty is fighting the heat, sand and burrs. I found a dead coyote (Canis latrans) south of there toward the dam my last visit. Half a dozen vultures were vultching in a tree like Snoopy. It looked healthy of fur except for scavenger cuts and I couldn’t see what killed it. Surely a gunshot would be heard in the nearby McMansions lining the lake there. I can’t imagine a larger predator killing it. When I hiked by a week later it was gone. These rocks have been submerged for a long time. If I were a fisherman I’d get GPS landmarks of the rockpiles for when the water returns. I pick up old lures and cans with pop-tops all the time. And faded Olympia beer cans. There are still fish here now but not nearly as many as when rain comes to the Great Valley (and to our little local foothills) and snow to the mountains. It’s fun to see the flooded, bewildered trees and scrubs who thought they were living on dry land; fish swimming like Koi (nishikigoi) carp in an Asian print above waving grass. Rain is predicted for Friday so I probably won’t have time to drive over the other side of the lake to Mormon Island to photograph the historic low water and artifacts. Just like I waited too late last year. It’s OK, there will probably be historic lows next year that I can photograph. Like the pictures above this has a ‘Holy Land’ feeling. 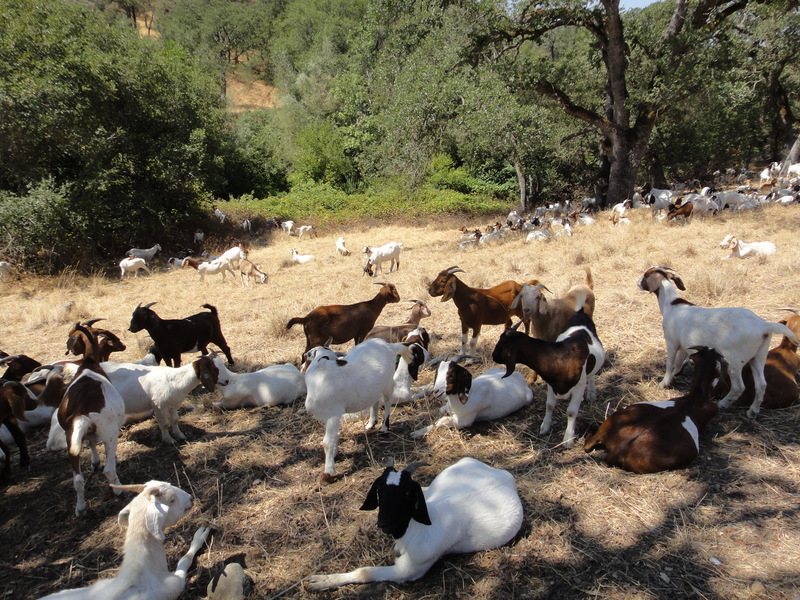 Goats are used by the City of Roseville for scrub control and fire prevention here on Dry Creek. They do a great job, herded by two dogs, guarded by two others of another breed, and tended by shepherds (Basques?) with a trailer (caravan), porta-potty, solar power and electric goat fences. The beasts leave little behind except dry pellets with a not-unpleasant smell which degrade with the rains into fertilizer.